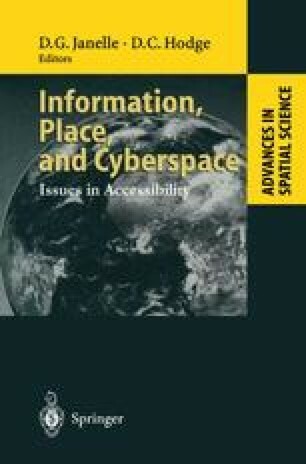 This chapter provides a broad overview of alternate ways for seeing the operative linkages between human experiences on the ground (in place) and user experi ences in cyberspace. Information is treated as the resource that binds these realms into functional human systems, while computer, telecommunication, and transpor tation technologies are viewed as tools of accessibility that are allocated differen tially among people, institutions, and regions. Two general propositions guide the discussion. First, there are significant structural linkages among information re sources, traditional places, and cyberspace; and second, grasping these linkages requires expanded models of space (and time) that encompass both the physical and virtual worlds.